I think everyone considers FB to be like the old telephone company. It is such a basic utility that using it as a universal password seems appropriate. It will be interesting to see if Google’s universal sign in challenges FB. My $ are with the hybrid mWeb experiences. The best overall value for the (considerable) effort. 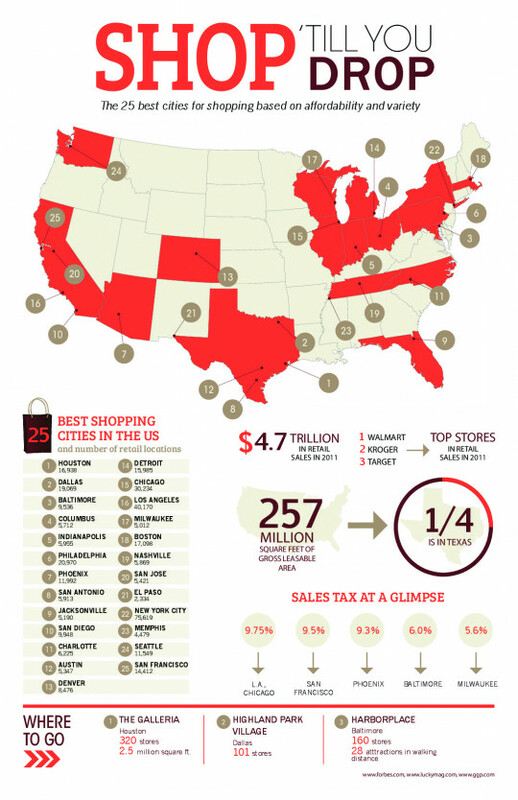 1/4 of all retail space is in Texas! Unfortunately, I believe the underlying argument is probably correct. While I get the importance of using information skills over remembering skills, I am not sure we are acquiring the former faster than we are losing the latter. As with so many other aspects of retailing, MAP pricing is unlikely to last for long. Information wants to be free! Looks so easy. But recent personal experience reinforces the fact that there are ideological factions in most organizations around the best approach, and the best platforms. As an infographic, this is a totally missed opportunity. There is so much creativity and innovation going on in the packaging space. Click here to seem some amazing concepts. Lots of data here, but message is clear: fewer opportunities for all education levels. Very interesting approach to promoting video as superior content form for marketing. However, video is not right for every audience or topic, so work needs to get done on making non-video content as trackable. Of course, the first is the most important. Majority of emails being opened on mobile/tablet devices. If the recipient clicks through and gets nowhere, or a lousy experience, they are gone.